Home Crepe Blog Scarves, Mittens, and Poppies. As the temperature is dropping, we are reminded that winter is just around the corner! In Canada, it never hurts to be ready for anything Mother Nature might throw you, (and she always throws something!). So, it’s about time we (begrudgingly) pull out our winter attire and prepare for the cold weather. November is the happy medium between the myriad of family-oriented events that happen in October and December. It’s a nice break from all the planning and craziness, but it’s not all fun and games. For the more proactive individuals among us, it’s the perfect time to start thinking about all your Holiday shopping. It also serves as a welcome reminder to try and avoid the dreaded Christmas rush that will be hitting the malls soon. Don’t say we didn’t warn you! We always have a special treat each month and November is no exception. This month’s crepe feature is the Choco-Dream. 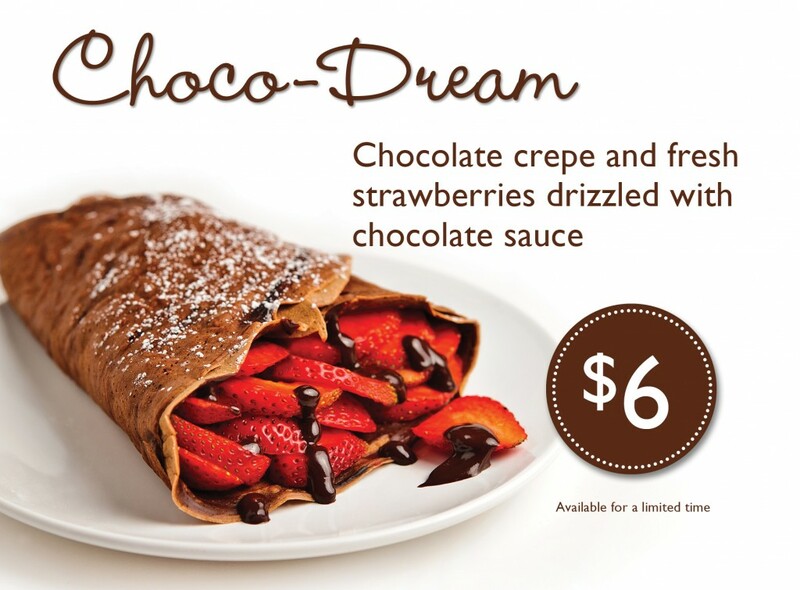 It’s a chocolaty twist on our classic crepe, with fresh strawberries and chocolate drizzle. For only $6 all month long, we’ve got your wallet and your sweet-tooth covered. If that isn’t enough for you, give us a call and invite us to your next event! We offer catering services for your corporate and personal events. Have a great November everyone!